The Gogarty Affair: ‘Old Media’ vs. Web 2.0. Blogger gets flamed. Dad weighs in. Newspaper criticises the readers. Journalist rails against the ‘mob rule’. This is the fascinating tale of Max Gogarty, 19, who has so far written a single short ‘blog’ article for the Guardian recording a self-funded trip to India. Seeing as transparency is the currency of blogging, I’ll come clean. I haven’t read the blog post all that carefully, I haven’t read the comments in their entirety (I can’t really because many have been deleted) and I haven’t read the cited wikipedia article or all of the countless comments made elsewhere on the web. But, it must be said, most of what I have read about Gogarty is, at best, uncharitable. That said, I have very carefully consumed the ‘old media’ rebuttals from the Guardian/Observer and been astonished by the snobbery, hypocrisy and, frankly, idiocy, of the ‘in-house’ response. Bear in mind that Gogarty’s piece was published in the blog section of guardian.co.uk which encourages us to ‘Join the Fray: the sharpest writing, the liveliest debate.’ A quick visit to the dictionary (Concise OED) illuminates: a fray is ‘conflict, fighting’ or ‘a noisy quarrel or brawl. Emily Bell, Director of Digital Content at the Guardian, wrote: ‘…it’s clear to me that Max, had he just been a freelance travel writer’s son, would not have been commissioned, but that his credentials put him at the top of the list for this kind of piece.’ Indeed, he does have impeccable credentials in ‘old media’ terms. He’s had a gig writing on Skins and experience with the Royal Court. I agree with Andy Pietrasik: ‘it’s impressive‘. But its Rafael Behr’s attack on the Guardian’s own community in the Observer that irks more. He argues that the ‘mob rule online’ is ‘amoral’, that ‘there is no presumption of civility’ and that Gogarty was condemned by ‘self-selecting judges’. Self-selecting judges? Like newspaper critics perhaps? Selected from a small group of journalists, they may be seasoned, but are they experts? And even if they are experts, does that mean they any more qualified to pillory, criticize or lampoon than the rest of of us? The Guardian/Observer runs dozens of reviews on movies, plays, restaurants and exhibitions every week and those reviews make and break careers. Some don’t pull their punches and a few certainly lack basic politeness or civility (even if they are wittily written). Some wound the people and wind up businesses they’re aimed at. Sometimes their criticisms are as harsh as those levelled at Gogarty. What is the difference? Behr’s quite right that ‘there is no such thing as the ‘online community’. There is no single online community: there are millions and millions of them. Some are generous and constructive, many are introspective and uninviting, others are welcoming and cuddly: all are robust and honest. But (and I’ve been involved in a few online communities in my time) he’s committed the ultimate sin: he’s attacked the community that sustains the Guardian/Observer. Behr hits the nail on the head, perhaps ironically, and identifies the commenters’ objection in his article: ‘he (Gogarty) was perceived to be bogus’. Gogarty and the Guardian community were a bad fit. To survive as a blogger you must be authentic and you must earn respect. Bell, Behr and Pietrasik assume that to simply be published in the Guardian is enough: Gogarty is somehow better than those who pass comment because the Guardian/Observer has selected him. Behr doesn’t hold back: a man with the Guardian mouthpiece is “on a pedestal”. That’s the ‘old media’ view. On the net, the blogosphere, in this Web 2.0, respect comes from below. Readers have power and opinions that count. It’s not just about impressing editors and commissioners. You’ve got to be real and attractive to the people who read you. All this brings me back to Max Gogarty, who is probably justifiably miffed by the storm. Hello Max! Ditch the Guardian. Set up a blog and carry on blogging. Write your stuff, tell your story. Don’t run away. The criticism hurts (of course it does: I’ve got some ghastly reviews on Amazon) but don’t let your dad and the editors fight your battles. If you reckon you can write, do it. Write and write and write. Some comments will be nice and others will be vile. But write and make that blog happen. If you’re good, you’ll find an audience. If you aren’t, it’ll be a great record for you, your family and friends. The project isn’t invalid just because the comments were bad: you may have simply chosen the wrong platform. But more than that, remember. You’ve done what we all dream off: you ‘went viral’. I reckon you’ll do very well. Write the blog, maybe even get an agent, hope for a book deal and be magnificent. But if you can’t take the heat, you shouldn’t be in the kitchen. 17 Responses to The Gogarty Affair: ‘Old Media’ vs. Web 2.0. If you want to indulge in nepotism, get a name like Smith. Latest from Emily Bell. It appears to remain the community’s fault. Strangely the last thing I wrote on my own blog before all this blew up was a piece about how the Guardian sneers at everything outside its own North London social circle. Its online side of things, in particular, from sport to fashion was becoming growingly sneery. I think this was one of the main reasons that readers were so angry over this piece. The anger, for the most part, was aimed at the paper and the travel editor, not young Max. The fact that they have come out fighting shows just what they think of their readers and the commenters. We’re muck they scrape of their shoes as far as they are concerned. The acknowledgement of a few more lessons learnt and something approaching an apology is in order. Emily Bell should be ashamed of her attitude. She owes young Max and apology too for putting him in this position. Quite a commentariat you’ve got on this blog Dan – good stuff. Let’s face it journalism and most of the media is full of nepotism – it’s baked into the system. As you say, the great thing about nu media is that if you’ve got talent you can now publish it and if it’s good find an audience. Indeed, the ‘old media’ is crammed full of legs up and jobs for the boys. But I remain bewildered that the Guardian (who make great claims to be web savvy and have the web 2.0 doyenne Emily Bell at the helm) don’t understand why, when translated to the web, it doesn’t cut the mustard with their community. 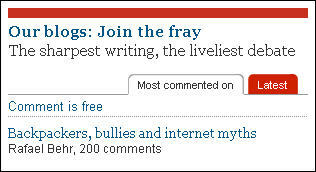 The Guardian’s treatment of their online community is, at best, patronising. Patronising at best – quite often it is downright abusive. It metaphorically talks about them to their face. There’s another small update in this whole affair – the Guardian’s Fiver email mentioned Gogarty affair too and spoke of its commenters in pretty abusive terms. Ourman: I’m (still) astonished by the bile coming from Guardian staff directed at their own community. Why aren’t they dampening the fires rather than stoking them? As I’ve said before, for me this isn’t about a blogger or questionable commissioning process anymore, it’s about a debacle of community management from a team who ought to (and claim to) be experts and know better. @Dan Wilson: I couldn’t agree more. The tactic adopted by the Guardian of rounding on their readers in a bid to calm things down is deplorable and seems to be backfiring. I used to like the Guardian, but as hysterical as this episode has been, (and painful to those on the other side of the learning curve) the lack of committed response to the crime from the paper itself irks me deeply… A lamb was thrown to the wolves, the wolves predictably ate him alive, those responsible have yet to be taken into account, or even front up to apologize. Everybody knows who you are, get it over and done with, and the sooner the better… Otherwise this entire situation is truly shocking, depressing and embarrassing! I await your approval on my next, v up to date post re the Crimea. No no, not Mrs. – you’re confusing me with Wallis Simpson I think.